With Disney pushing a slate of five Star Wars movies in the next few years, talk has quieted about the long-rumored live-action TV show Lucasfilm had been working on before the sale to Disney. While there were reports of Lucas writing scripts and ABC blocking out time slots, several years of updates with no show has left us wondering who is more foolish; the fool, or the fool who follows every Star Wars rumor that comes down the pike. 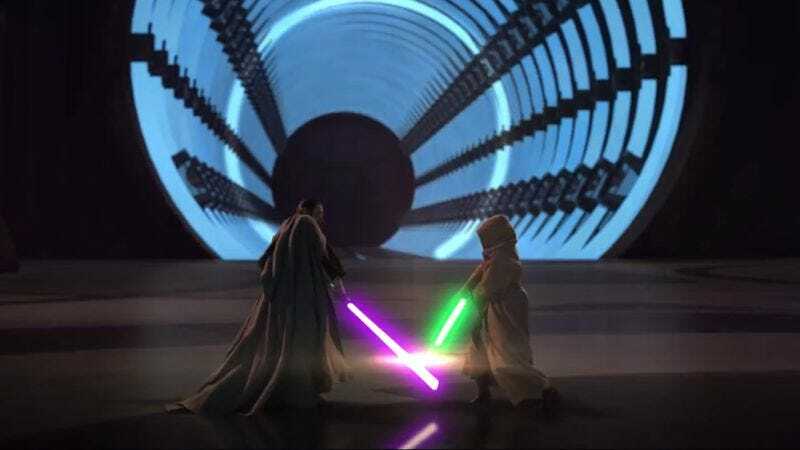 But we now get a definitive answer—the show is no longer being developed—and a brief glimpse of the what might have been in the form of a short scene that includes some pretty decent special effects for a TV budget, a kicker that ties the scene to the larger Star Wars universe, and most importantly, a quick lightsaber battle. The scene was created by actor/producer Paul J. Alessi, who also appears in the clip, and seems to be a proof-of-concept that would have led to a full pilot. At least, until the Disney corporation decided there is more money in films than there is in episodic television. UPDATE: As it turns out, the information that accompanied this video was incorrect. It was not created as neither pitch nor test footage for the live-action Star Wars TV series, but rather as an independent proof of concept piece for Lucasfilm, by a small group of industry professionals. Alessi was merely an actor in it. It has no relation to any current Star Wars project, and we've removed the video at the request of its creators.